Remember when I said that Phil Wilson could be a plant by Vic Hurlbert and Pam Mason in the Auditor’s race? 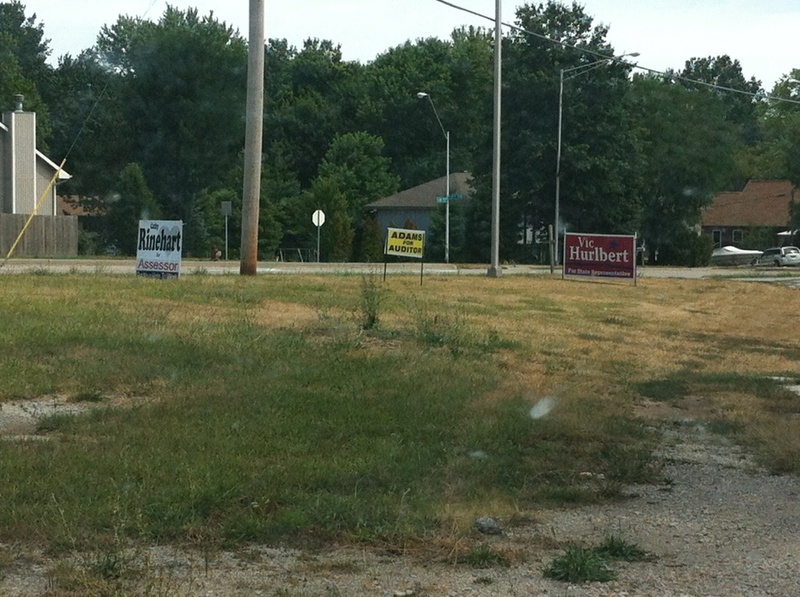 I spy with my little eye a Charles Adams, Vic Hurlbert, and Cathy Rinehart sign over on North Oak. Coincidence? You be the judge. I have been meaning to get around to this, but just have not had the time. I wanted to issue a quick endorsement for Jesse Leimkuehler for Clay County Treasurer. Mr. Leimkuehler contacted me awhile back, originally about the County Auditor race. Mr. Leimkuhler changed races because he thought he was better qualified for this office. I found Mr. Leimkuehler to be a refreshing face entering the Clay County political scene. Mr. Leimkuehler is by far the more qualified candidate for this race. He has a double major in Accounting and Business Administration. He also has a Masters in Accounting with an emphasis in Accounting and Business Administration. According to his Facebook bio, Mr. Leimkuehler has “worked on developing accounting systems over a 10 year period at Sprint, Commerce Bank and the US Dept. of Agriculture.” He now runs a growing small business in the Liberty area (Belvoir Winery).” His opponent, Ted Graves, is a soon to be retired elementary PE teacher and coach. What bugs me about this race is the fact that I think uninformed primary voters may choose Mr. Leimkuehler’s opponent primarily based upon his last name. If you go by Mr. Graves’ website, that seems to be what he somewhat expects you to do. Even more annoying is the fact that he touts the endorsement of Congressman Sam Graves on his website. Family or not, Mr. Graves is not the best candidate for this job. For more information on Mr. Leimkuehler please check out his Midwest Democracy Project survey. Mr. Graves did not fill one out.